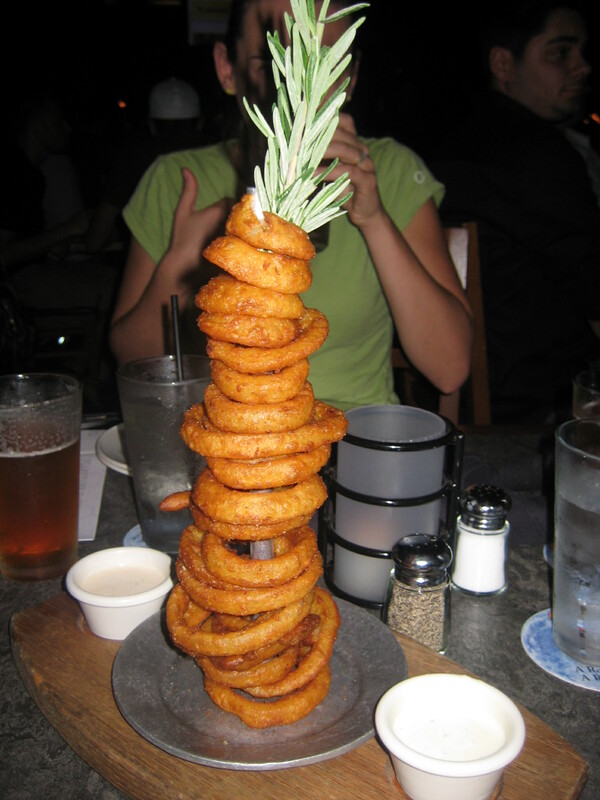 Honestly, I have no idea how many places in Hawaii serve up onion rings but every time I go home, I crave the ONION RING TOWER at the Yard House (chain restaurant found in nine states) on Lewers St. in Waikiki and I think that it’s the best I’ve ever had. It comes with both regular Ranch and Chipotle Ranch dipping sauces and is piled high on this pole. The batter is very light, crisp and slightly sweet and I could probably eat the whole thing by myself but I have always shared it with someone. If you order it, make sure you enjoy it with some of their over 100 draft beers! Apparently they have the world’s largest selection of beers on tap! The downside of the place is that it is very noisy and you can’t really book reservations. 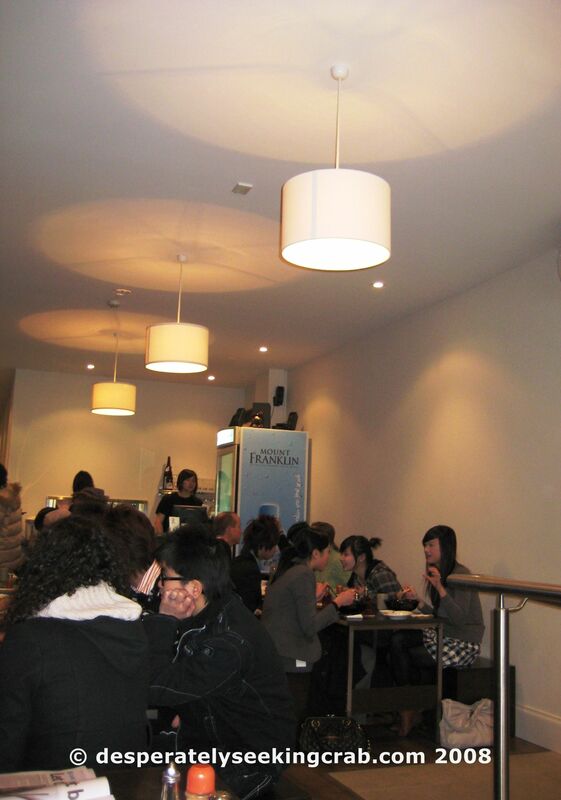 The weekends are very busy and the wait can be around an hour for a table. 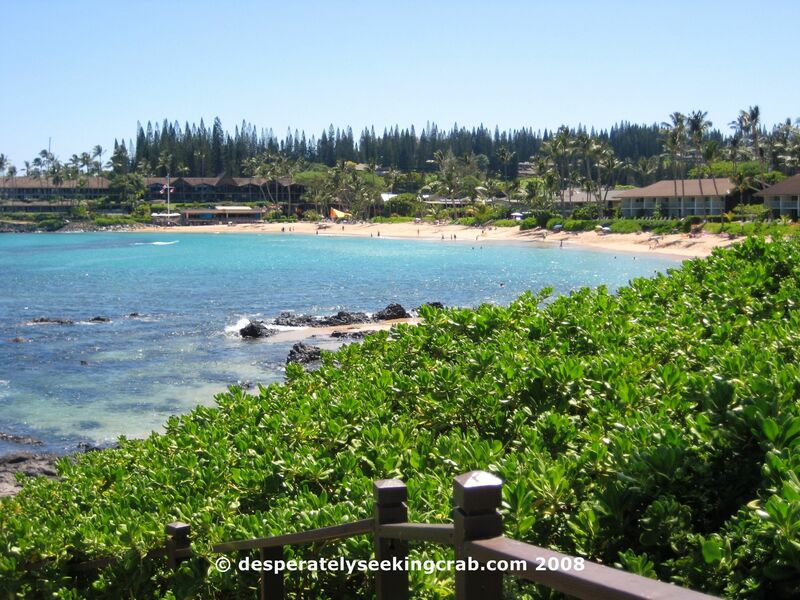 Luckily, the restaurant is right where there are new shops to whittle the time away. To finish, their Kona coffee ice cream sundae was as HUGE (as big as my face) and it was very, very tasty. Hubby got the Lemon Souffle Cake and it was really disappointing so don’t waste your time on that (didn’t even taste like lemons). In the last six months, things have been a bit hectic – I had a very sad death in my family, I quit my job and had a baby. I am still trying to juggle having a child and blogging about food because my days of sitting in front of a computer have definitely reduced. Although having a baby did not deter me from celebrating my wedding anniversary! My due date was a week before my anniversary and was hoping that the birth and anniversary wouldn’t coincide but luckily I ended up giving birth a week and a half early. By the time the anniversary rolled around, my bub was nearly three weeks old. Having just gotten over being shell-shocked from caring for a newborn, we were so pleased when a new restaurant called Sparrow opened up not too far away. When I called to make reservations, I had a choice of 6:30 pm or 8:30 pm. The old me would have chosen the later reservation but I knew that it would be too late and boy was I so glad that I chose the earlier time. The thing that I had to get used to was to tell them that we were two people and a pram (stroller). I desperately fed bub on the way to the restaurant and hoped bub would stay asleep. The staff were nice and very accommodating to us and for a weeknight, it was absolutely packed (which is fortunate because the baby wasn’t able to be heard about the noise). 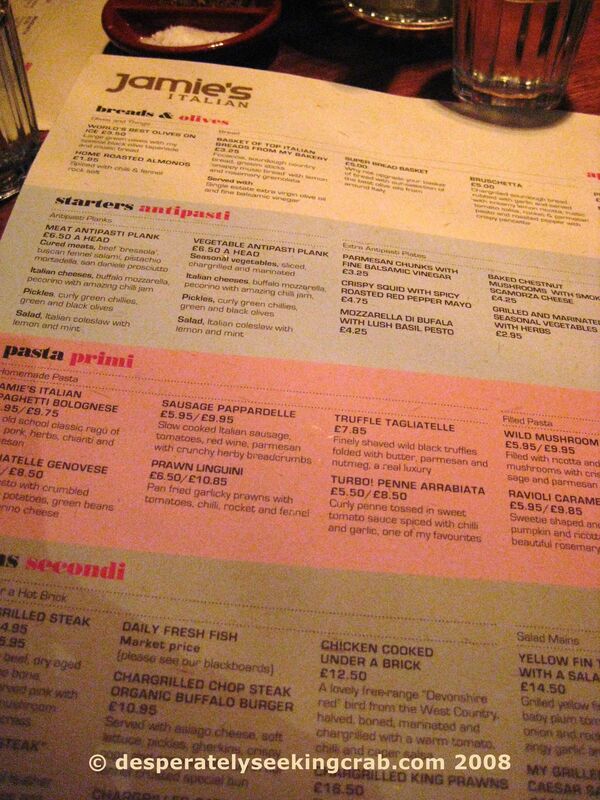 The menu is extensive and you can have a choice of tapas, pasta, pizza or meat. Up until we ordered the food, it was going great – bub was asleep. Then just as the starters arrived, bub started to whinge and I was getting so stressed out. My husband lovingly spread their lovely French butter onto the homemade bread and tore me pieces of the Bresaola that we ordered and popped a Spanish olive into my mouth. Phew, just a short cuddle later, bub went back to sleep! Sparrow’s pasta is very tasty. 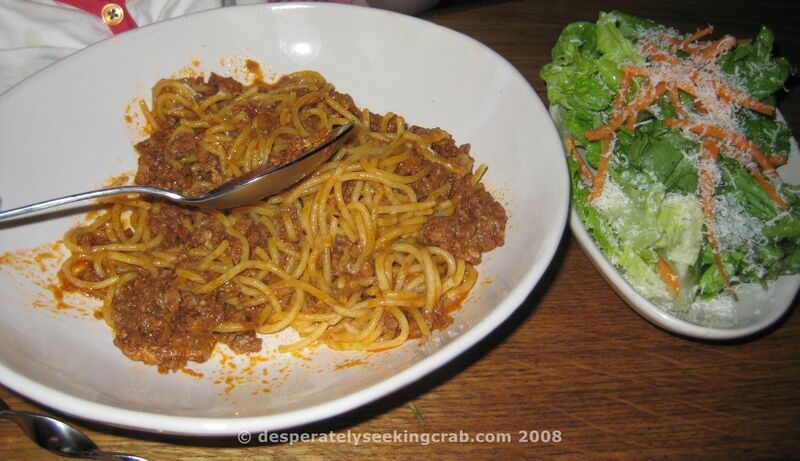 If you love spaghetti bolognaise, you should try their take on it – an amazing ragu with a few different types of meats. Next time though, I will try their degustation menu. My friend Jacqui has eaten there many times now and has recommended a few tapas items. They have quirky things like “duck donuts” which I am dying to try next time. We were able to eat our meal with bub asleep almost the whole time and had a fabulous time. So many people are scared to take their babies out but I think that it can be done with some planning and of course – luck. Right now, my baby is a bit more difficult to take out but I have not altered my lifestyle too much yet. It should be interesting to see how things change especially when they are able to run around! Tell me your stories of when you first took your bub out to dinner. Any tips? Funny stories? I haven’t even upgraded my iPod to an iTouch (I have an old iPod Mini) nor have I purchased a new laptop in many years. I have only just upgraded my mobile phone that includes a good camera, MP3 and internet capability but I can barely keep up with technology. Twitter is, of course, the new micro-blogging site where you can tell the world every minute detail of your thoughts and doings at any given time. I signed up for an account the other day but I’m still wondering how to incorporate it into my life. So far, the only way that Twitter seems useful to me is if you use it on the go with your mobile phone but it’s definitely not made for stay-at-home mothers. Twitter’s usefulness in the food industry is a different story especially when restaurants update their menus and their whereabouts to all their following fans. This is especially useful if a restaurant’s location changes nightly such as a taco truck in Los Angeles. NPR (National Public Radio) in the U.S. did an article on Kogi, the Korean-Mexican mobile restaurant (aka Taco Truck) in L.A. In the article Tweeting Food Truck Draws L.A.’s Hungry Crowds, writer Ben Bergman talks about how Kogi’s success is owed largely from their fans following Twitter to track where Kogi will be parked on a particular night and what specials there are each evening. Apparently, there are over 8,000 people following Kogi on Twitter and since joining Twitter over a week ago, I also became a Kogi follower even though I live nowhere NEAR L.A. and am not planning a trip there anytime soon. I am following Kogi just in case I get to go to L.A. within the year and use my cool phone to track them down one evening. I have to say that the combination of Mexican and Korean – two of my most favourite foods (apart from Japanese) makes me want to hop on the next plane to try their tacos. Looks like old-fashioned food reviews in newspapers are not going to be the only influence on a food business anymore – seems like technology has caught up with networking sights such as Facebook and Twitter and to keep up with the trends and to attract future crowds, we have to keep our minds open and sharpened to the latest marketing tool. But I have to admit, even though I’m not exactly old, it is truly exhausting keeping up. 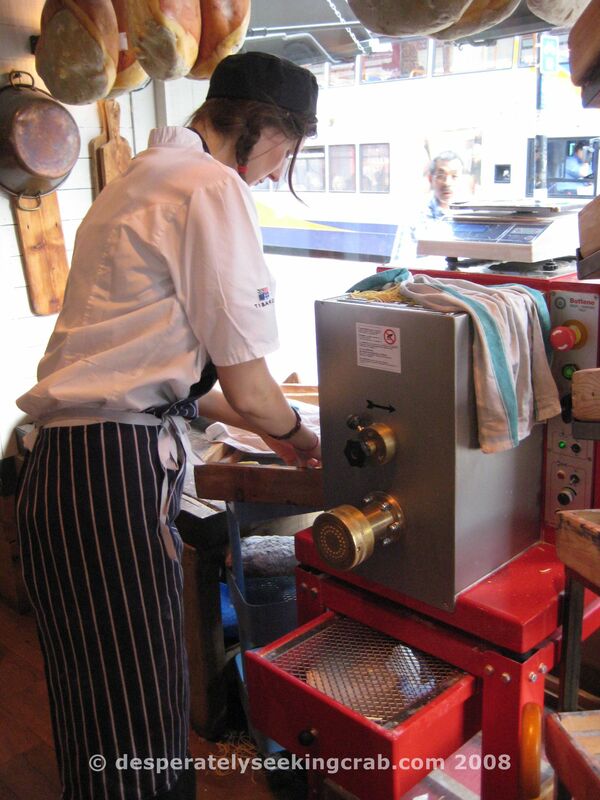 In September 2008, I spent some time in Oxford (a place close to my heart) to present a paper at the Oxford Symposium on Food & Cookery (more on that later) and to visit some old friends. I haven’t been to Oxford in two years and I noticed that a few new restaurants had popped up – one of which was Jamie Oliver’s Italian Restaurant simply called “Jamie’s Italian” on 24-26 George Street. I can’t even remember what was there before (if you remember, email me please). It is the first restaurant in a planned 20 restaurants completely backed by Jamie and his business partners (currently the other locations are Bath and Kingston). 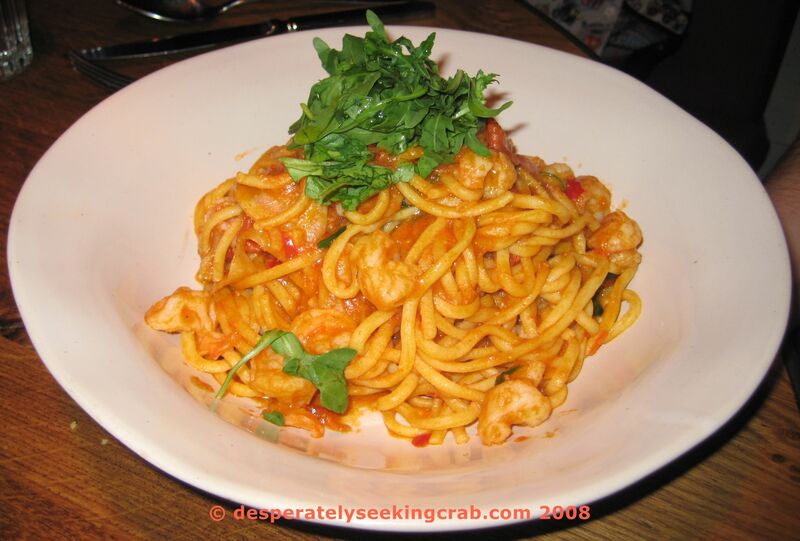 The idea behind his Italian restaurants is to provide good, casual Italian food – similar to Antonio Carluccio’s successful chain through Britain called Carluccio’s. The restaurant doesn’t take reservations but according to their website, if you are a group of 8 or more, they may accommodate you. Luckily we arrived at around 2pm, which was after the lunch rush but we still had to wait a little while for a table. 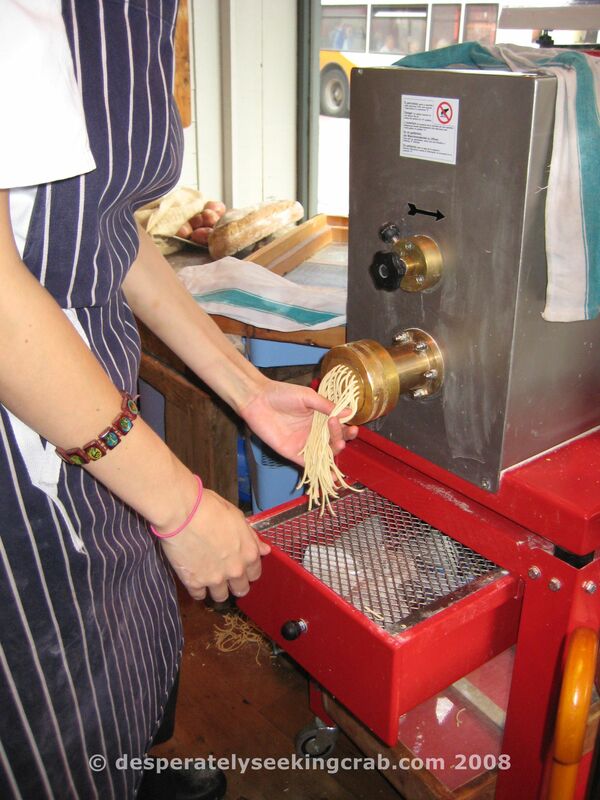 The restaurant was buzzing with people and while we waited, I watched an employee making fresh pasta in front of the large window that faces the main street. I was quite impressed that they made the pasta fresh, as needed. We were seated in the back of the restaurant and because we were starving, it didn’t take us long to decide what to order but me and a friend were both agonizing whether to get the prawn linguini or truffle tagiatelle so we decided to split them. The other thing that impressed me was their children’s menu. Jamie is well-known for educating children to eat healthy, real food – no chicken nuggets and chips or hot dogs at this joint – the kid’s meals were basically smaller portions of adult pastas such as spaghetti bolognese served with free, all-you-can-drink cordial. Kids even got crayons, stickers and a cool twirly fork to eat their spaghetti (which probably requires your child to be at least 4 or 5 yrs old to maneuver properly). Our friend’s daughter is 3 and she was too young to understand the concept that if you run the fork between your thumb and forefinger, it will automatically twirl your pasta for you but it is a very cool concept if you are a kid! We ordered a bruschetta and two bowls of gorgeous green olives which my friend’s daughter relished nearly all by herself. We as a table ordered the pumpkin ravioli, sausage pappardelle, truffle tagiatelle, prawn linguini and a kid’s spaghetti bolognaise. 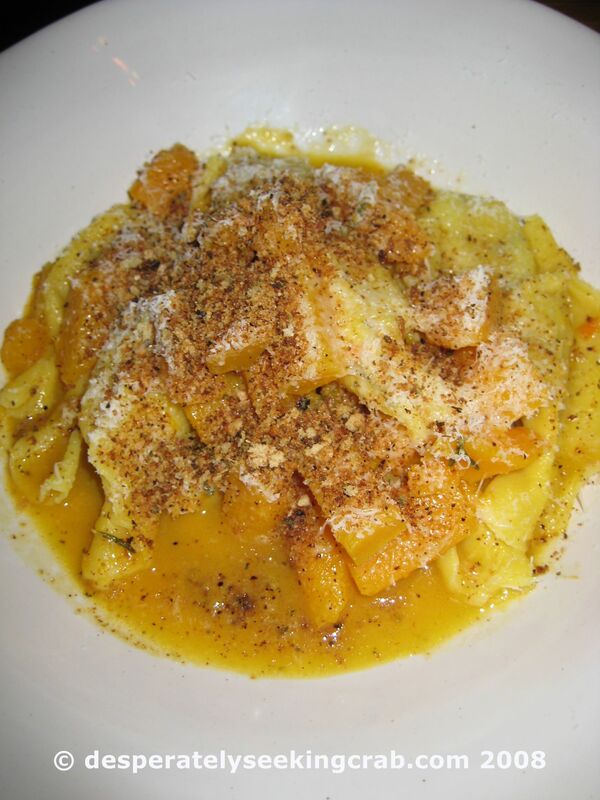 I loved the sausage pappardelle (very meaty, rich and satisfying) and the truffle tagiatelle was just simple buttery and truffle-y pasta – yum! 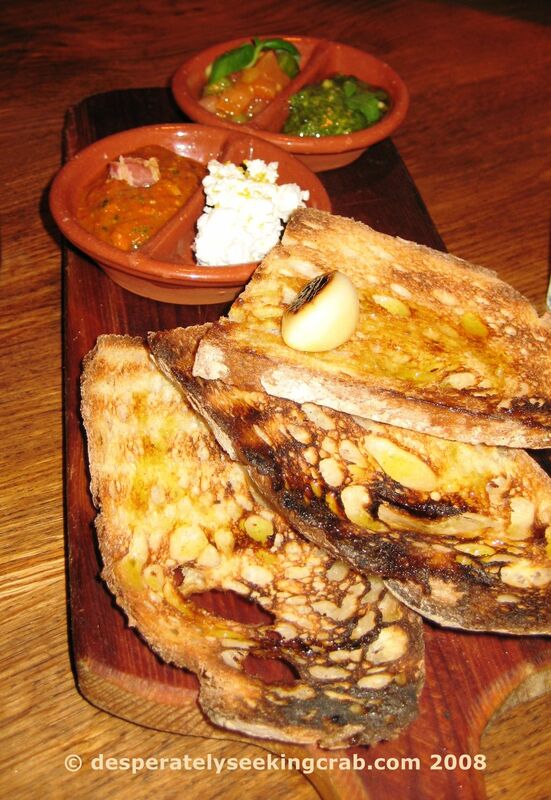 The bruschetta was a bit odd – toast was so hard that it sort of ripped the roof of our mouths. I have a feeling that we ordered another starter but I cannot remember it – which means that it was not that great. I would definitely stick to the fresh pastas and next time I go, I want to try some of the meats (which sounded very good). For a party of 4 adults and one child, the price of the meal wasn’t too bad – it was actually affordable by English standards but with our Australian dollar so weak at the moment, after I saw the currency conversion on our credit card statement, I nearly had a heart attack! The only complaint I have is that the service was forgetful and although most of the tables around us were pretty empty, our young 20-something yr old server seemed to have friends eating at the table next to us and just kept chatting to them while we kept trying to get her attention. The bad service should be no excuse especially since we started eating after the major lunch rush. Perhaps it would have been more attentive if we sat in the lighter, airier at the front of the restaurant. Overall, it was one of the best meals I had in my travels when considering value and quality. We did eat at a couple of Michelin starred restaurants (more on that later too) but of course, the price was much higher and the food was often more complicated than I was in the mood for at times. 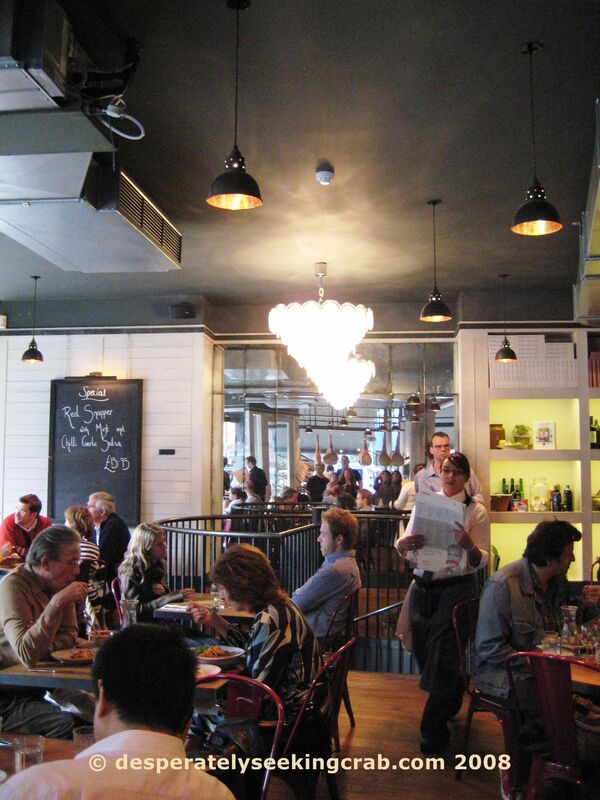 Jamie’s Italian is a good, casual place to eat that is also very child friendly without compromising on quality. 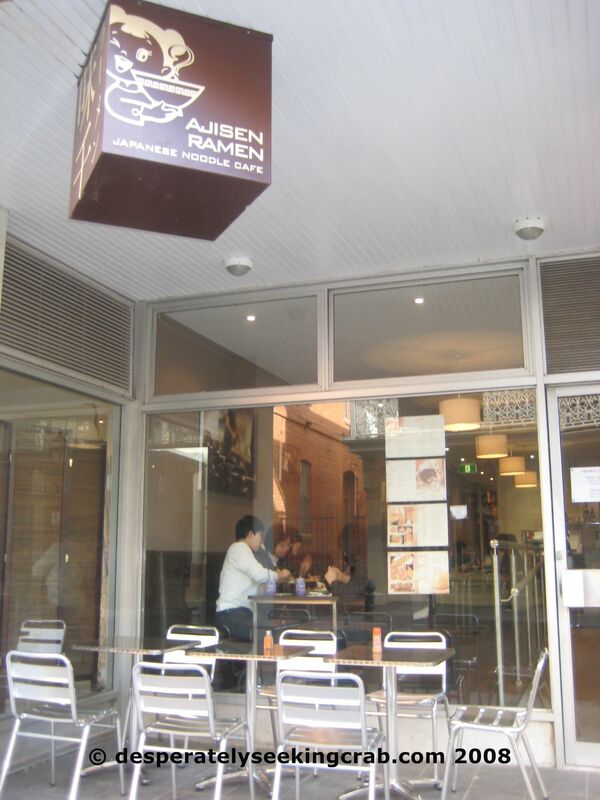 Ajisen ramen, a chain from Kumamoto, Japan has opened a small outlet on Leigh Street (the tiny lane off Hindley St). 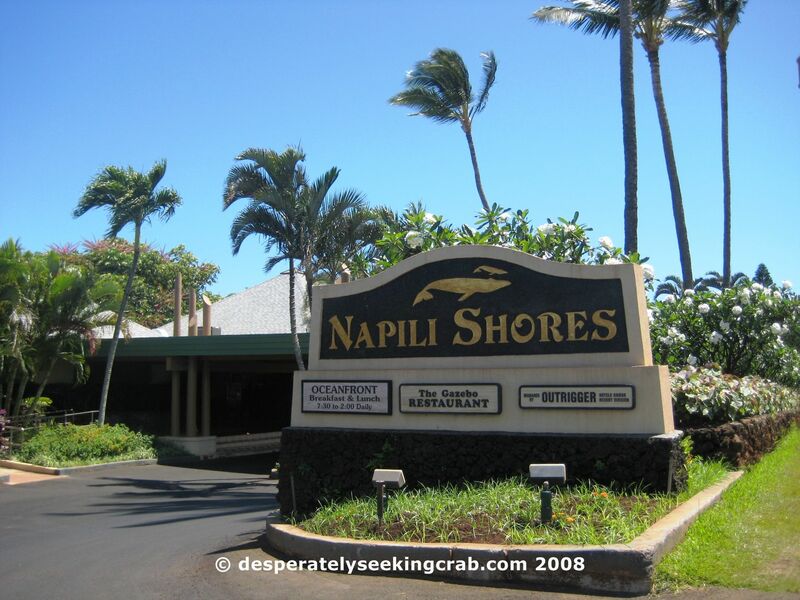 They are open everyday except Sundays and are open for lunch and dinner. Every time I pass by the place, it is packed! I had to make a reservation one lunch with two girlfriends so that we could guarantee ourselves a table and that’s rather unheard of in noodle joints! BusinessWeek Asia says that Ajisen (meaning a “thousand tastes”) is planning to open about 500 outlets in China alone! 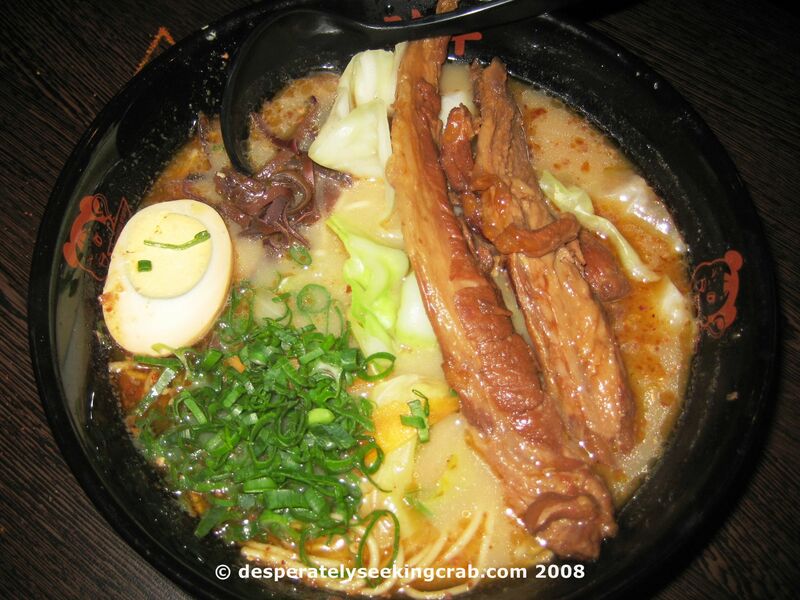 Ajisen’s signature broth is the tonkotsu or pork broth with its slightly cloudy, white colour. 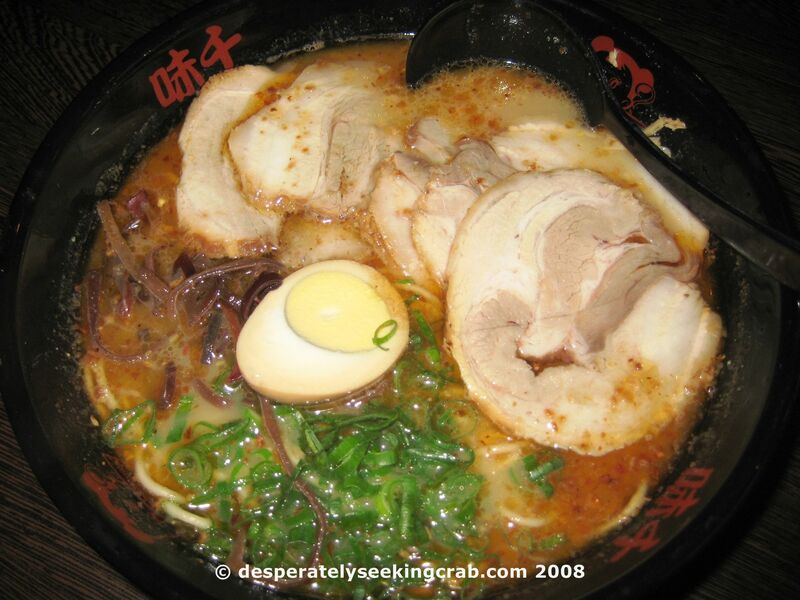 Tonkotsu is very different from miso, shio, or shoyu ramen that you can get in Japan. It is my absolute favourite broth in a ramen and I was very excited! Because I was judging for authenticity, I decided on a traditional Chashu Men, or in Chinese, Char Siu Mein. Japanese style pork tenderloin sliced thin, floating on fresh noodles in pork broth ($10AU). Yum! My friend Katie also ordered the same but Jacqui ordered the ramen with Spare Ribs in the same broth. Both the pork tenderloin and the ribs were melt-in-your-mouth tender and the noodles were cooked just right, with a slight bite to them. There were about 20 different ramens to choose from including stir-fried yakisoba. 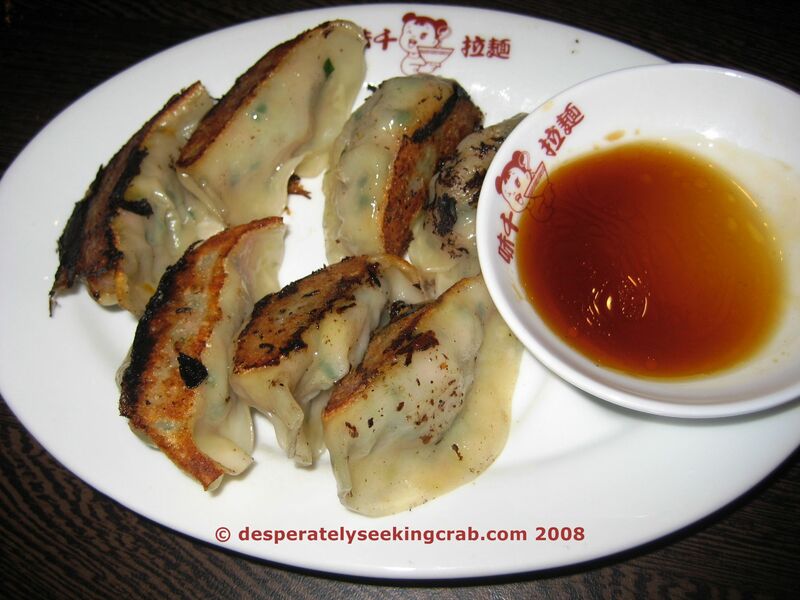 No ramen eating experience is complete without gyoza. Although our server forgot about it until after we had practically finished our ramen, the gyoza tasted homemade, was very generous in size with a lovely crisp skin and juicy pork filling. 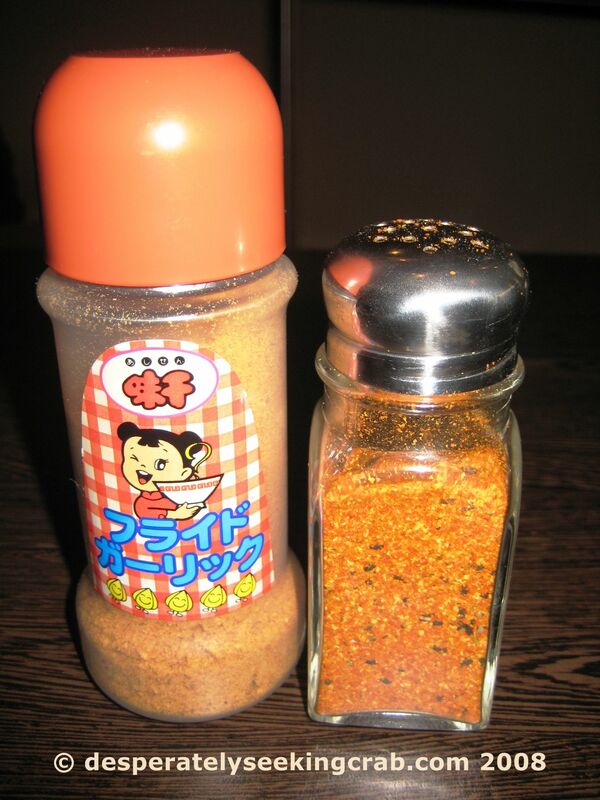 Don’t forget to try some of the fried garlic topping sitting on every table to sprinkle on your ramen. Beware, it’s very strong! What I found interesting is that the bottle is written entirely in Japanese with NO translations anywhere but I suspect that people will eventually figure it out. 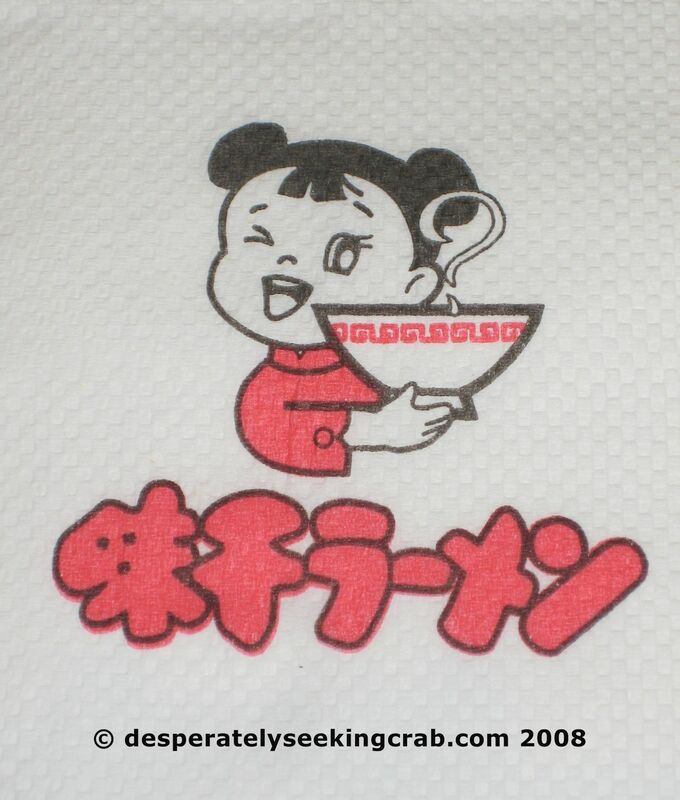 All in all, you get a lot of food for very little money and I would definitely recommend it (just don’t expect much from the service) – and not because it’s the sole ramen restaurant in Adelaide. It is definitely a great fast meal before seeing a movie. Service was rather forgetful and confused but I usually give up getting much service in this city so it wasn’t a huge shock to me. 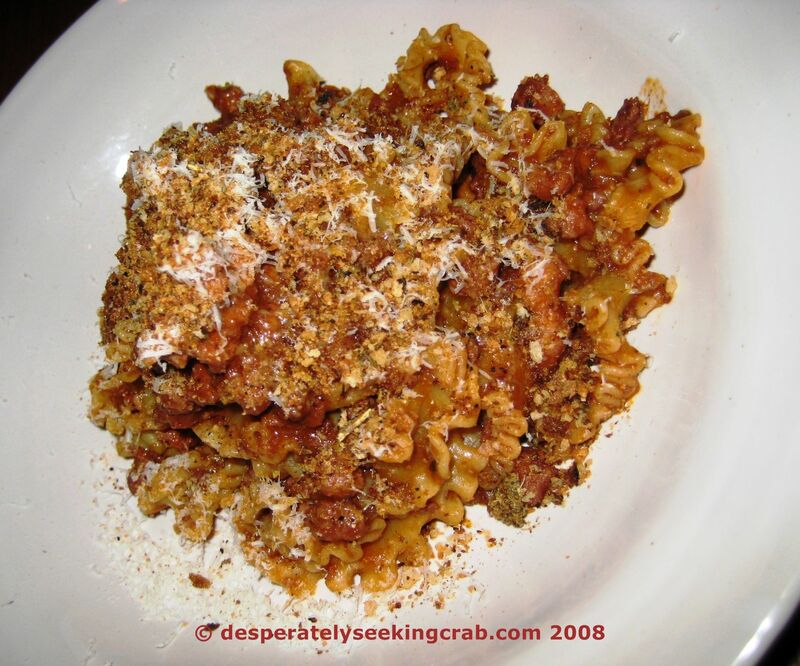 Definitely a tasty, inexpensive and warming meal – especially in winter! 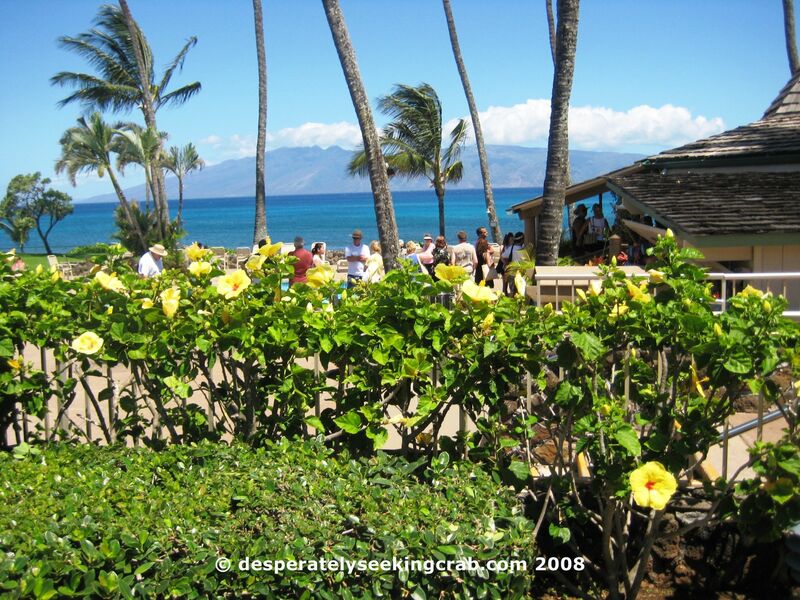 My favorite place to have breakfast in Maui is at the Gazebo Restaurant at the Outrigger Napili Shores resort in Napili Bay (just above the bustling resort area of Ka’anapali). I first ate there almost 10 years ago when working for the travel industry and it is still as busy today as it was back then. 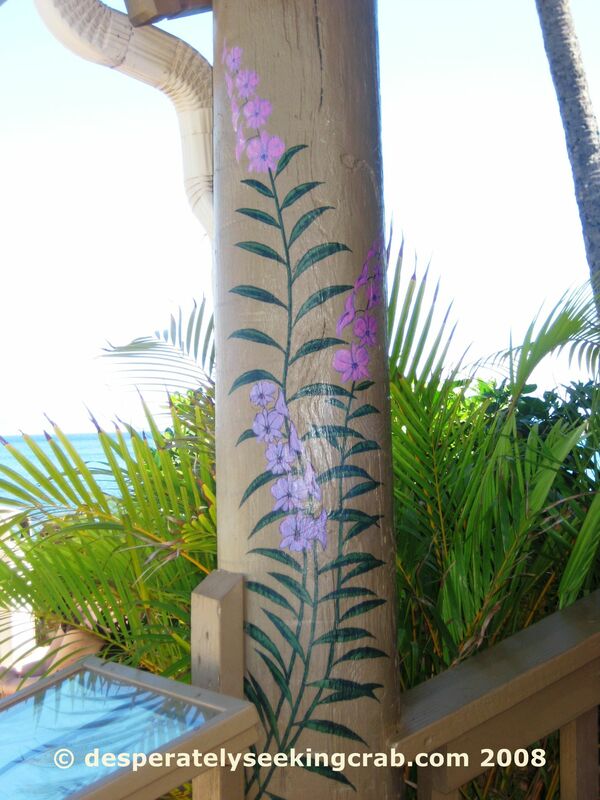 According to TripAdvisor.com, the Gazebo Restaurant has been voted by travelers as #1 out of 125 restaurants in Lahaina. Wow, I am surprised that a breakfast and lunch place beat out numerous high-end dinner restaurants. What makes this place so popular? 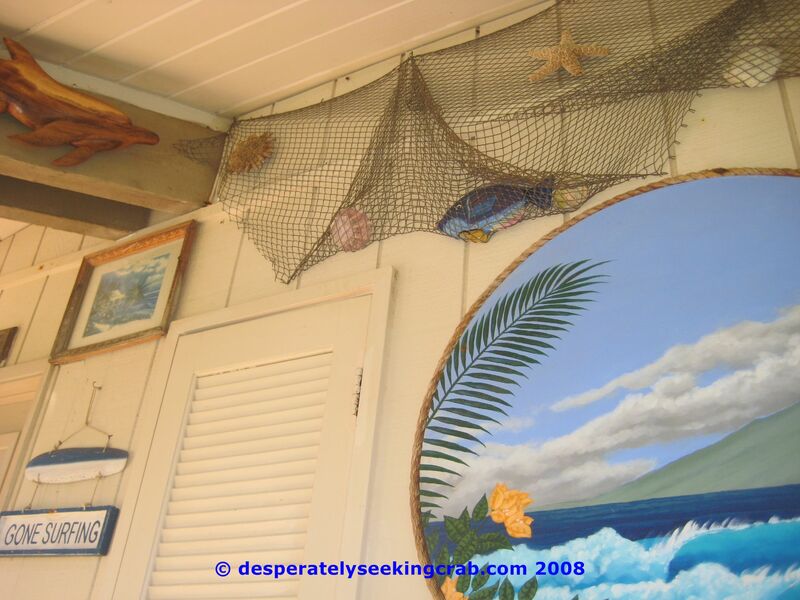 It is a combination of the oceanfront view (and a direct view of Moloka’i), generous portions, great pancakes, fast and friendly service and great prices – after all, in a place as expensive as Maui, a bargain is hard to find when it comes to dining out. Let me warn you that no matter what time you arrive to eat, there will be a long line to get in but I’ve never waited any longer than 30 minutes (although I’ve heard some people waiting longer than an hour). 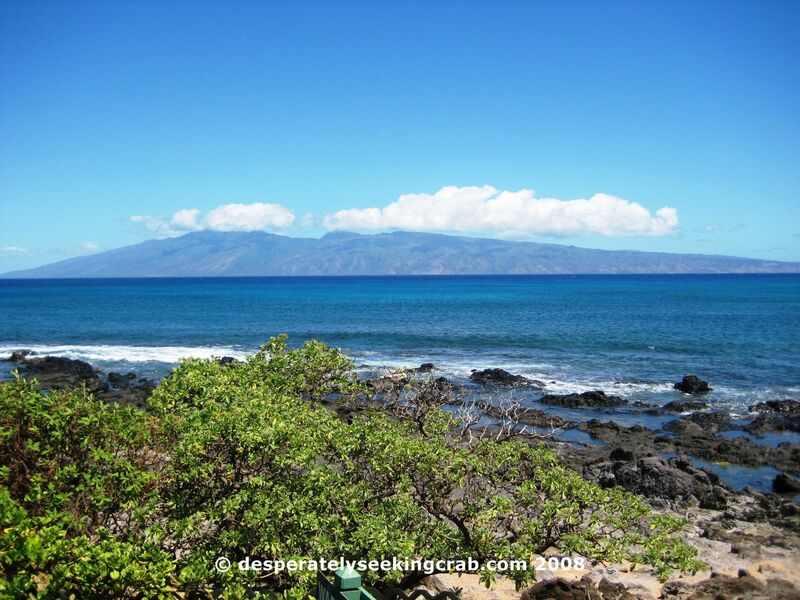 If you go to Maui during whale season, you will most likely see whales and/or dolphins breaching while waiting in line. 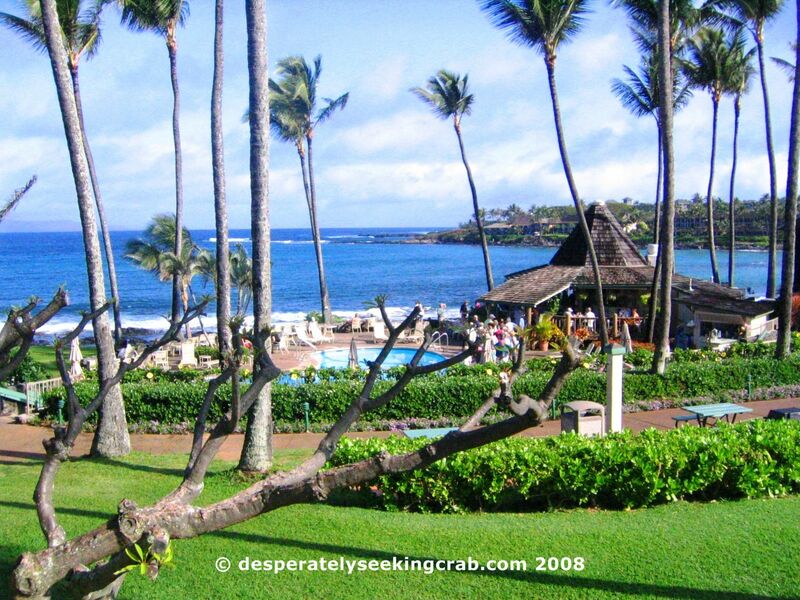 There is even a large bell that the hotel encourage that you ring to notify everyone else that you have spotted a whale. The hotel is also nice enough to provide a large urn of coffee for the hotel guests and people standing in line for the Gazebo free of charge. Hey but you’re on vacation so waiting shouldn’t be a huge deal right? If you hate waiting, bring a good book. 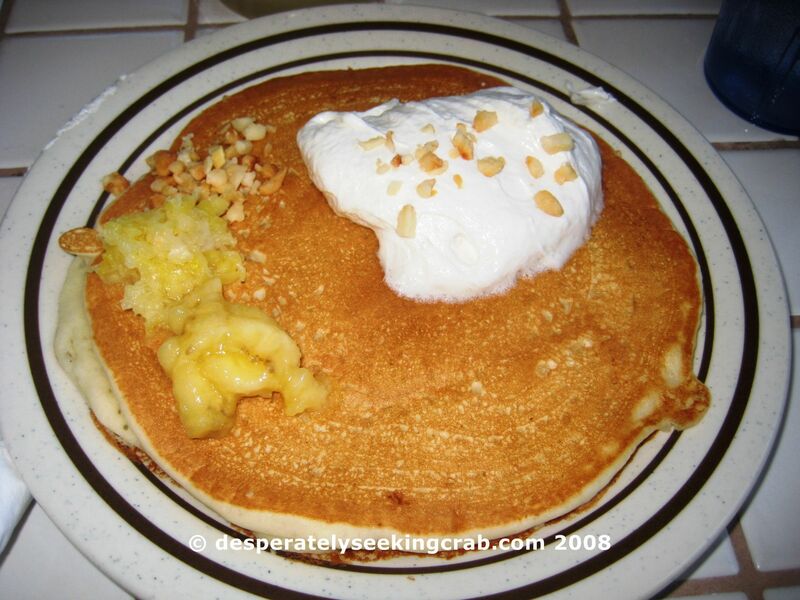 I love ordering the macadamia pancakes because they are so fluffy and they are very generous with the nuts. They also top the fluffy pancakes with a very light whipped butter and there are several syrups available to eat with the pancakes. This time I went to the restaurant with my mother and we decided to share a short stack of the macadamia, banana and pineapple pancakes (which is one large pancake with the three toppings placed on top) and a half-order of the fried rice and a large pineapple juice all for under $20. If we ordered full sizes, we would have been able to feed four people – not kidding. 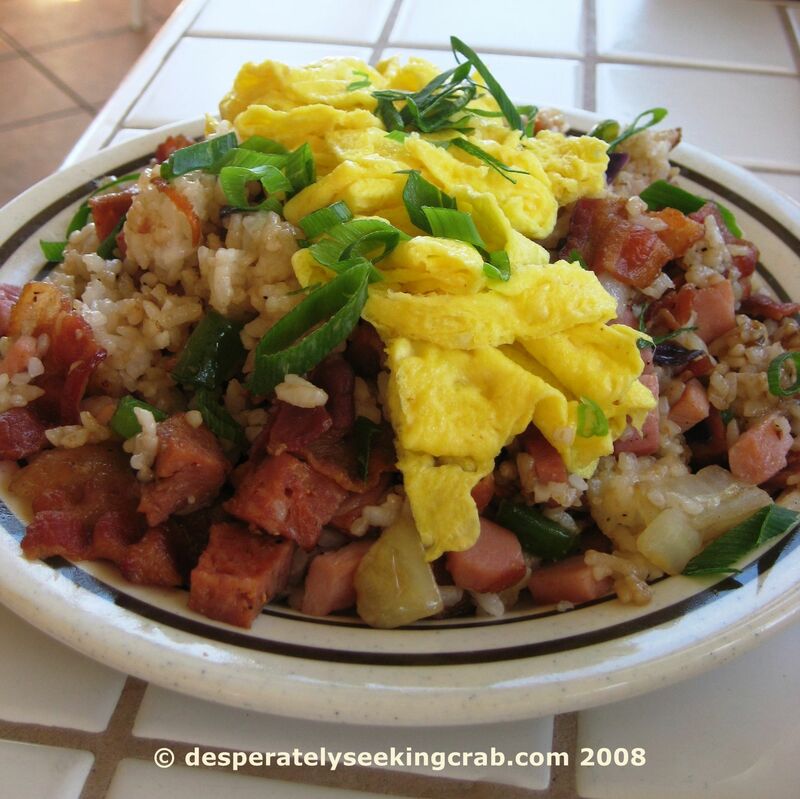 The fried rice was flavored lightly with soy sauce, onions, lots of black pepper and full of tasty meats – ham, Portuguese sausage, bacon and Spam, topped with some scrabbled egg and green onions (scallions), yum! The fried rice was very fulfilling and it was nice to have the sweet and salty together at breakfast. 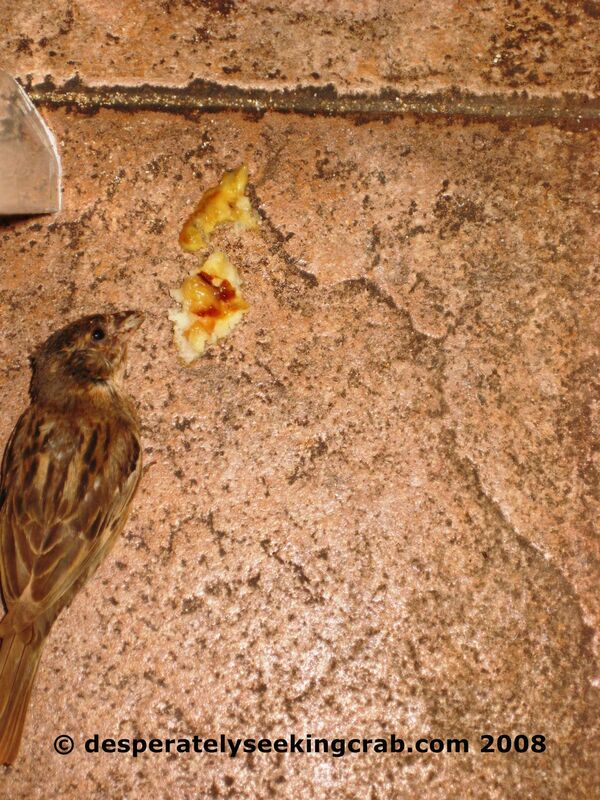 Beware of the smart little sparrows though if you order the fried rice! 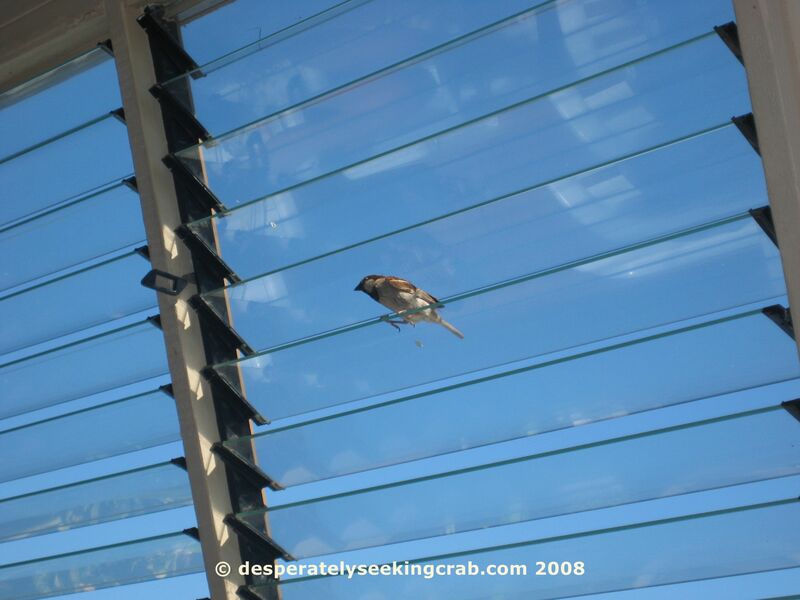 They sit on the glass window panes above the tables and wait to attack your plate and according to the servers, the sparrows love to hone in on the eggs on top the fried rice. I was so surprised when a sparrow grabbed a large piece of egg (mid-air) and did it so quickly that I barely had time to react before the rest of the sparrow gang devoured it on the ground next to me. It was amazing! Never in my life have I seen such smart little birdies…see, even they like the breakfasts there.